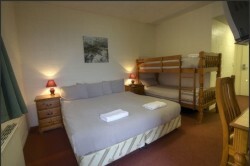 Use the form to enquire about accommodation at Mt Buller Abom. The Mt Buller ABOM Apartments are stylish and modern self-contained apartments located next to the Mt Buller ABOM family bistro opposite ski school on Bourke Street. Great value accommodation for a family or group of friends with the convenience of being situated in the heart of Mt Buller. Mt Buller ABOM Hotel is situated in the perfect spot for families, located on Bourke St opposite the Mt Buller Ski & Snowboard School. With Mt Buller Abom King & Family rooms available, as well as two in house restaurants open for breakfast, lunch and dinner ABOM Hotel offers excellent hospitality and an unbeatable location. We look forward to welcoming you to The Mt Buller ABOM this winter. Whether this is your first visit to the snow or you’re a regular skier, you’ll enjoy our hospitality and ski-in/ski-out location. Choose from a cosy double through to a spacious 4 bedroom apartment situated right in the heart of the village, directly opposite the Ski and Snowboard School on Mt Buller’s most renowned ski run, Bourke Street. When it’s time to relax, join us at ‘Skates’ coffee bar, enjoy a bite in our famous Mt Buller ABOM Bar & Bistro, or enjoy the buzz of Moosehead Bistro which is a perfect function space… So many options! Famous for it’s freshly made pizzas, enjoy a casual dining experience at the Mt Buller ABOM Bistro surrounded by a huge collection of ski memorabilia in an ideal ski-in, ski-out location. Take in the views over Bourke Street while you sit back and savour a relaxed lunch or cosy dinner. The Moosehead bar downstairs is open every night, complete with an open fireplace and a big screen TV. Join the locals on Monday’s for a game of darts or keep us in mind for your next private function. What happens when I arrive? In summer - it's easy. Simply drive up the Mt Buller Road into the Village, along Summit Road and you can pull up and park right at the door! When the snow starts to fall and the winter ski season commences guests can still drive up the mountain although there are a few things to know: * Overnight guests are required to carry wheel chains for safety, and fit them if directed; * A resort entry fee is charged on arrival at Mt Buller and attendants will give you direction on road conditions and where you can park your vehicle; * You will be met at your car by the resort taxi service that will transfer you and your luggage directly from the carpark to the ABOM (charges apply); * There are also free shuttle services available for passengers travelling without luggage.